Note: These new GFEs will unlock their respective orb skins when rolled. Active: All bind type recovery. Change Heal, Jammer & Poison to Light. Lskill: 2x HP & ATK Healer. Increase orb movement time by 2 seconds. 6x ATK when 4+ combos matched. Active: Full HP Recovery. Change all orbs to Light. LSkill: 4x ATK when HP = 100%. Increase orb movement time by 2 seconds. 4x ATK & 2x RCV for Light. Active: Change Dark to Light & Water to Heal. Enhance all orbs. LSkill: 1.5x All stats Gods. Increase orb movement time by 2 seconds. 6x ATK when Light & Heal matched. Active: Reduce HP by 50%; Deal 200x Dark damage to one enemy. Change left column to Dark, change right column to Heal. LSkill: 3x ATK per Dark or Light cross matched. 4x ATK And 50% damage reduction when Heal cross matched. Active: Increase Fire orb spawns by 15% for 3 turns. Change right column to Fire. LSkill: 2x HP & ATK Devil & Attacker. ATK increase when 2+ Fire combos matched, up to 7.5x ATK. Active: Increase Wood orb spawns by 15% for 3 turns. Change right column to Wood. LSkill: 2x HP & ATK Physical & Dragon. ATK increase when 2+ Wood combos matched, up to 7.5x ATK. Active: 3x ATK Dragon & Machine for 1 turn. Change Light & Jammer to Fire, Wood & Poison to Dark. LSkill: 1.5x All stat Fire. 3x ATK when 6+ combos matched. 2x ATK & slight damage reduction when Fire & Dark matched. Active: Change all orbs to Fire, Water, Wood, Light, Dark & Heal. Lock all attribute and Heal orbs. LSkill: 2x HP & ATK Dragon. 2x ATK when HP > 50%. 4x ATK when 4+ attributes matched. Active: Change left column to Dark; Change right column to Heal. 2 turn Bind and Awoken Bind recovery. 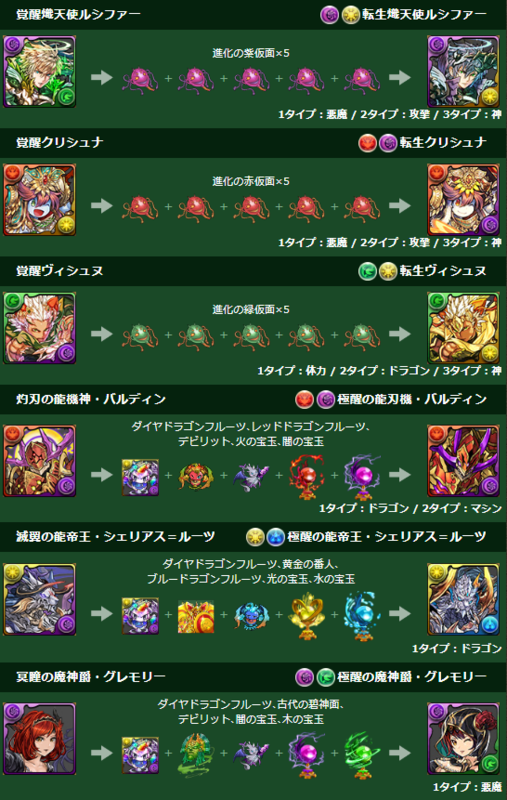 LSkill: 2x ATK & RCV for Devil. 2x ATK on skill use. 5x ATK & 50% damage reduction when Heal cross matched. We've been so spoiled by strong and easy leaderskills lately, now I can't imagine ever going back to playing a cross leader.